Update 2: Continued thinking about this, and I am pretty sure that there is nothing of value here. I will leave this post up mostly because it is good internet practice, but also to showcase my Malcom Gladwell-esque tendency to fit meaningless anecdotes into a terrible, ad-hoc theory. So here you go, internet, proof that my mind is perpetually hazy. 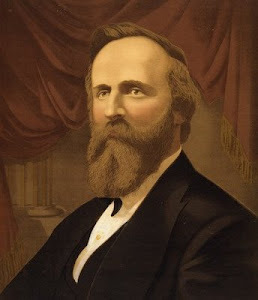 The centennial election in 1876 of President Rutherford B. Hayes was mired in fraud by both parties in Florida, South Carolina, and Louisiana. With the subsequent disputation of the eligibility of one of three Oregon electors, there were twenty electoral votes that could not be legitimately apportioned, enough to put either Hays or his Democratic opponent Samuel Tilden over the top. This stood as a constitutional crisis greater than any since the end of the internicine conflict ten years prior. Theories of how the electors should be assigned were, unsurprisingly, correlated strongly with pre-existing partisan beliefs, with the Democratic House asserting primacy as furiously as the Republican Senate asserted their own. In January of '77 President Grant got Congress to agree to a bipartisan commission with seven Republicans, seven Democrats, and a single neutral party, the widely respected Supreme Court justice David Davis. Justice Davis, however, was so astoundingly incorruptible that when the Illinois legislature, a Democrat controlled body, voted to make him an Illinois senator (apparently a completely unsolicited bid), Justice Davis resigned from the commission, stating that his unasked for elevation rendered him too tarnished to make a fair judgement. There being no other person in all of the federal government more interested in fairness than partisan outcome, President Grant gave the newly vacant seat to Justice Joseph Bradley, a Republican, and in a series of wholly partisan maneuvers the commission ruled in favor of Hayes. Perhaps because of the partisan imbalance, and perhaps simply because the decision went against them, the Democrats refused to accept the legitimacy of the commission, with the House going so far as to declare Tilden the true winner a mere days before Hays was sworn in. In the end, Hays and his supporters promised to end reconstruction, effectively delivering the three contested southern states to the Democrats for the next hundred years. It was this compromise which allowed the election to finally be legitimized, though the President Hays gained the derogative nickname "Rutherfraud", proving that it isn't vitriolic blogs but human nature itself that keeps our political discourse in the gutter. In a disputed presidential election, be it the election of 1876 or the election of 2000, there is no possibility of bipartisan harmony simply because there is no act in American Politics more fundamentally partisan than the elections process. In 1876 (really the first few months of 1877) what was achieved was not a bipartisan accord but a grand compromise. When we consider that the ultimate purpose of political parties is to get elected, it is somewhat stunning that a compromise was even possible over an issue which was so fundamentally political. Why was no similar compromise possible in the voter fraud controversy of 2000? My suspicion is that the answer revolves around the rare (in politics) availability of a positive sum exchange. If the Republicans had not held onto three states which voted for them only because of the presence of federal troops, an extreme situation with no analogue in 2000, there would have been no incentive for the Democratic party of 1877 to support the election. A caveat: compromise was possible in this extreme situation only because both sides held bargaining chips that were denominated similarly (an exchange of 20 electoral votes now for three states of electoral votes for the indefinite future). However, as we go through this discussion of compromise, we must remember that political parties can and do make things happen without civil war breaking out. The 2000 election went through on a purely partisan basis, as did the Obamacare law nine years later. In contrast to this event is the institution of farm subsidies. Allow me to make the apparently controversial point that no one cares about farm subsidies as much as the people who receive them. It is here that we move, in a typical year, from compromise down to the level of bipartisanship. Until recently, farm subsidies passed nearly unanimously, and even now they are protected by a group of congressmen in both parties from farm states. A key difference between a contested election and farm subsides is that there is only one presidential election every four years, and therefore the only thing that can be exchanged for an election is the credible commitment to give away elections in the future. Obviously there was no way to credibly commit to giving away future elections during the 2000 dispute, as the circumstances of 1876 were unique. With farm, subsidies, however, there are no such constraints. It doesn't matter how much or what type of farm subsidies congress gives out, since Democrat supporting subsidies do not come at the expense of Republican supporting subsidies, and in any case, neither party is a regional concern to the extent that the early American parties were, and neither consider farm policy to be a central issue (and neither do most Americans, on the off chance you think that the will of the people plays anything but the smallest role in these considerations). Farm subsidies, from the perspective of a congressperson, are completely free. There may be single issue voters who only care about preserving farm subsidies but in the current political environment there are no single issue voters who oppose them. Furthermore, overwhelming majorities in both parties have few opinions either way, meaning that they are not sacrificing some greater moral value by voting for them. In this paradigm of Voters and Values, both parties can find for themselves a Pareto improvement, where incumbents from farm states can accrue a few extra votes without anyone sacrificing a strongly held moral value. So wow, I just wrote a whole bunch and it became astoundingly incoherent, so I deleted a bunch of it. I think I have deleted all the way back to the last place this made any sense, so I will leave off there and maybe come back to it later. Update: Let us consider the abortion issue in this framework. While the political parties are not organized explicitly around abortion, it has been a powerful litmus test for the last forty years and the parties have assorted themselves around this debate. I imagine that it looks similar to the gay marriage polling, but more polarized. Abortion is a political issue which arrays itself along profound core values, either the autonomy and self-ownership of women or the murder of innocent children. There is no good way to exchange one of those for the other, and not really something anyone is interested in compromising on ("only a few murdered children" or "only slightly enslaved" is not a platform that anyone is running on). As an added bonus, when profound moral issues are involved we can expect large segments of the voting public to be polarized as well, and to vote only for the candidate that supports their morals, meaning that trading away core values also means that you are trading away voters, making compromise doubly expensive. Though, of course, a politician may end up gaining voters by compromising or changing positions, but even gaining more voters than before may not compensate for the moral loss, meaning that politicians whose values differ from their electorates on any particular (core) issue are less likely to be re-elected. What I am getting at here is that in periods of turbulence, like the era from the depression to the 60's, a great deal of compromise should be possible, because issues arise without strong context, meaning that Pareto improving compromises can be found between the parties (see: everything Nixon and Clinton did as president except for the criminal things). However over periods of stability in political positions (neither parties' rhetorical stances on economics and social issues have changed much since the late 70's, gay marriage among Democrats being the biggest exception) the compromises that can be found all get found, and slowly compromising politicians find that more and more often they are forced to choose between compromising their values and losing votes. It was through this process that piles of southern democrats were either kicked out of office or changed party. I am getting incoherent again. This is fairly muddled, and I think the conclusion it is coming to is that, when you consider the competitive pressures of regular elections then over time representatives will tend to look like the the modal (as opposed to median) voter, since that is the constituency they stand to lose the most from if they deviate from those views. Further, as this process goes on, their political opponents (necessarily people with different modal voters) will be able to offer fewer and fewer compromises in which both parties find themselves able to pick up voters. Where as perhaps previously a Democrat could take an ideological victory in exchange for a pork project favorable to Republican districts, this has over the last thirty years become less possible. Part of the reason this post is incoherent is because I am not certain of the conclusion myself. I have come to the conclusion that politicians do things because that gets them the most votes, but that wasn't in doubt in the first place, and I seem to have allowed my implicit assumption that politics is multi-polar to do the heavy lifting for me to conclude that the modal, as opposed to the median, voter who controls politics. After all, the median voter theorem plots voters on a one dimensional line from conservative to liberal, but the truth is that everyone has a bundle of (often contradictory, or at the very least unrelated) points of view. Why should it be the case that belief in gay marriage correlates to support for universal health care? But because there are lots of people who believe that, however you care to plot it, there are lots of representative who also hold that particular view bundle. When view bundles change over time, with certain issues being re-prioritized (think that fewer people care about NAFTA now than when Pat Buchanan ran for office) and certain issues changing among modal voters (think the decline of overt racism) politicians can compromise to pick up voters with slightly different bundles. Over time, however, competitive pressures push the parties towards opposing modal bundles. As an example of this, observe the behavior of politicians in both parties towards medicare. Old people vote disproportionately, and we can safely say that the modal voter supports preserving medicare. However, there is one highly prevalent bundle that supports medicare and opposes abortion, while there is another highly prevalent bundle that supports both medicare and abortion, and the two parties pick up these two nearly modal bundles. 1) Where the American Public supports something with over (say) 65% support, the policy will be embraced by both parties, what's more, each party will claim that the other side opposes that policy. I will look very closely for places where this does not hold true, since it seems so "obviously" correct and is consistent anyway with the median voter theorem. 2) If there exists a modal voter (a claim that has yet to be tested), their beliefs will look a great deal like the beliefs of the two party platforms. It would take a very particular sort of survey to test this. 3) In times where the disparate beliefs of voters are more strongly correlated (i.e., when people who oppose gun control are more likely to oppose abortion and support tax cuts, as opposed to selecting just one or two of those things), compromise is more difficult, since there is less potential arbitrage among modal positions across issues. A criticism: Bills, typically, all contain things that fall into the same heading. While there is often room for lots of things inside that heading, and completely unrelated riders do get stuck into bills, the typical bill on capitol hill is about one thing, meaning that compromise between issues is limited and, in this homogenized era, there are few potential trade-offs between different classes of voters, reducing the situation faced by representatives to an approximation of median voter theorem. I emphasize that this is mostly me thinking out loud. I suspect, having gotten this far, that the conclusions that can be drawn from this model are either trivial or wrong, and the whole thing could simply be trivially wrong.